This Rumble ended on 2003-08-31 00:00:00.0. Family: His friend Tasslehoff Burrfoot who has a talent for messing with people's minds. Arch-Enemy: The Queen of Darkness, Takhisis; the arrogant megalomaniac goddess. Family: Her father Andy McGee who has a minor talent for mind-control. Arch-Enemy: The head of the Shop, known as Cap; the weak-willed closet transvestite scientist. Charlie sat down on the park bench. Her father and her had been traveling for days by car across country trying to keep a low profile and escape the clutches of "The Shop" who had gotten way too close in the past couple weeks. This was the first chance she had to get some fresh air and relax. She jealously watched the other children from a distance playing and squealing in joy. Her father had forbid her to join them. She was special. She had to remain safe, and out of the way. Her headaches had returned and she desperately needed and outlet for all the pent up frustration that had been building up within her. While she was lost in thought she barley noticed and old man in dusty gray robes had taken the seen next to her. "Hello child. Beautiful day isn't it?" Her father had gone to get them some food, and the old man looked odd with his bent gray hat, but he had a kind face and seemed friendly enough. Plus Charlie knew she could take care of herself if it came down to it. "Yes sir. It is." The old man nodded and held out his hand. With a little mutter he held out his hand. "Do you like magic? I know a trick or two." As he said this a small flame jumped from his hand and lightly danced across his knuckles. Not one to be outdone the little girl smiled and said "I know that one," then she held forth her hand and created her own small dancing flame. Obviously impressed and a bit taken aback the old man looked down at the child. "Well what about this?" he asked chanting a bit an making a softball sized sphere of fire appear in his hand. Charlie watched as the tiny flame, that had been dancing across the old man's knuckles, jumped up and started burning the old man's hat. She giggled, concentrated and created a sphere of fire in her own hand. 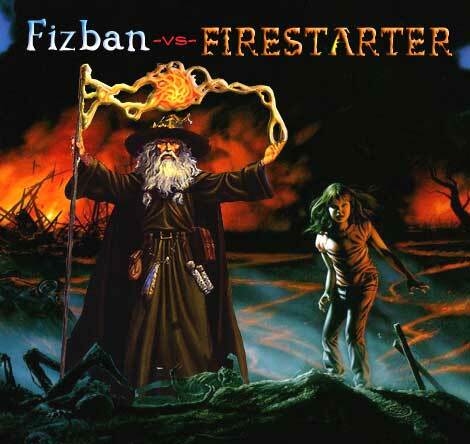 Fizban, feeling a bit miffed at being shown up by a mere child, stood up and made a great display of shooting fire between both hands. Flames licked the trees above and sparks fell to the dry leaves of the ground and began small fires. Caught up in the excitement Charlie stood up as well creating her own fiery display and laughing all the while. Flames from the two started to spread outward into the park. People started running for cover. Fizban, ignoring the commotion in the park around them, extinguished the fire dancing along his hands and said "Impressive little youngster, but I wonder if you've ever heard of this spell called.. Freefall? Firemall? ahhh, Fireball that's it and with that he began casting a spell to summon forth a huge ball of rolling fire. Charlie relished the chance to finally release the power pent up inside her. Caught up in the challenge and the excitement of the game Charlie began concentration on releasing that energy in one huge explosion.